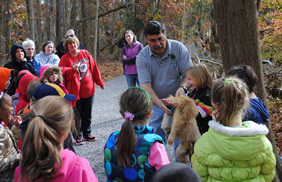 School groups visit the FREC to experience the forest through fun, hands-on activities and experiential learning. View the program descriptions for groups K - 12. The FREC also provides programs for college classes, clubs, and adult groups. •	Groups between 10 to approximately 40 people per program requested. • Number of programs available is dependent on staff availability. 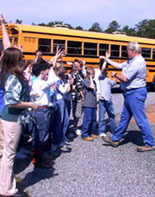 • Schools with large numbers should plan on booking multiple days in smaller groups. •	You may have lunch after the program, but you must take your trash with you. •	Wear long pants and closed-toe shoes to protect from poison ivy and ticks. When does the FREC give girl scout and boy scout programs? Can you come to my location to do a program on-site? We provide programs on the FREC property only. Spring and fall programs are popular. Programs for these seasons are often booked a year in advance. Contact the education coordinator for a list of available dates. At the NJ Forest Nursery students experience the work involved in the collecting, sorting, processing, and germinating of seeds. The nursery produces more than 300,000 tree seedlings yearly. The group tours the greenhouse, nursery fields, and orchards. Acorn planting and a hayride may be included if seasonal timing and weather permit. This trail enhances perceptual skills and increases sensory awareness of our surrounding environment. A guide rope directs students to tactile signs and "talking trees" along the trail. A boardwalk leads from the upland portion of the trail through a hardwood swamp to the headwaters of the Toms River. Here students can sit and observe, reflect, and do creative drawing and writing. An investigative hike on the Swamp Life Trail introduces the fascinating forested wetlands. Students find swamp creatures, visit an informational kiosk with a "talking tree," and look for swamp clues such as snags, blown down trees, pond life, and vernal pools. This program focuses on change in forest composition over time, called succession. Along the trail the group sees evidence of wildfire and insect infestation and the effects of carefully planned prescribed burning and forest management techniques. Students also discover how pioneers of this area utilized the forest. Students hike along the FireWise Trail and stop at several locations to identify evidence of wildfire, and observe fire management techniques including prescribed burning, fire buffers, and fire breaks. Learn the tower observer's job at the "fire tower" and how to be firewise. 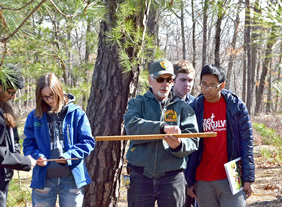 During the hike students learn forest ecology, detect animal signs, and identify and use of a variety of tree species. Along the trail observe effects of competition, lightning, wind, and human activities on the health and growth of the forest. The group also stops at a scenic overlook of the Toms River, and learn about tree rings using a cross-section of a 225 year old tree called the Indian Oak. 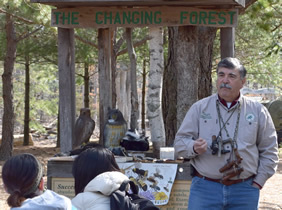 Participants in this hands-on program learn about trees and shrubs used to make forest products, and may get an opportunity to touch, taste, and smell samples. Students also observe milling of sawlogs into lumber, growing shiitake mushrooms, bee pollination, and participate in making maple syrup at the sugar shack.